LG WASHER IE ERROR CODE = WATER INLET ERROR = NO WATER ENTERING WASHER is the definition of the IE or 1E error code on your LG washing machine. If your LG washer is getting the IE error code, there can be a few reasons why the IE or 1E error code can display. The IE error code on the LG washers display is indicating water did not fill the tub or it did not fill properly in the allotted time. This can be from a faulty water inlet valve, drain hose issue, bent water hoses, the water valves to the washer are not “open”, or there may be a communication or wiring harness issue. All these issues can cause your LG washer to display the error code IE. Below we will show you what to check and how to fix and clear the IE error code. LG Washer Getting IE Error Code – What Does IE Mean? – How To Clear Reset Fix IE Fault Code? When your LG washer shows the IE error or fault code, this means WATER INLET ERROR. This error code is telling you the washer tub did not fill with water in a specific time. The error means the water did not reach the correct level within 8 minutes. 2 – Check and be sure the HOT and COLD water supply valves are fully open. 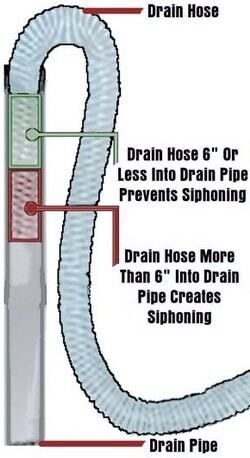 3 – Check that the HOT and COLD water supply hoses are not bent, damaged, or clogged with hard water. 1 – Turn OFF the HOT and COLD water supply valves on the wall. 3 – While the water hoses are removed, check where the hoses connect on the washer and be sure the INLET VALVE FILTER SCREENS are not clogged. 4 – Get a large bucket to hold a few gallons of water. 5 – Place the ends of both the HOT and COLD water valves into the bucket. 6 – Turn the water valves on the wall to OPEN and run water through the hoses to test water flow and pressure. 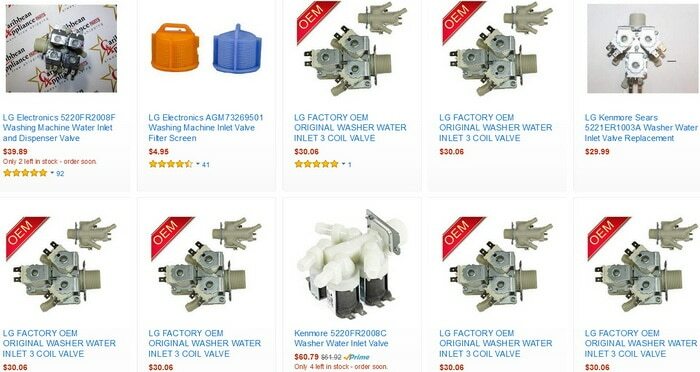 7 – If water flows with no issues then you may have an issue with the water inlet valve. If all the above checked out, next you need to check the water inlet valve. You will need to get to the water inlet valve and check to be sure it is secure and the wire harnesses to power it are secure and connected properly. You can test the valves with a multimeter to determine if it is faulty. 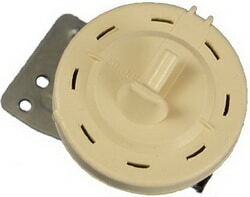 If you find that the water inlet valve is not working, you should replace it. NOTE: If you get water fill and both water inlet valves are working properly and you still get the IE error code, this MAY indicate a problem with the water level pressure switch. So check the pressure switch to be sure it is operating properly. 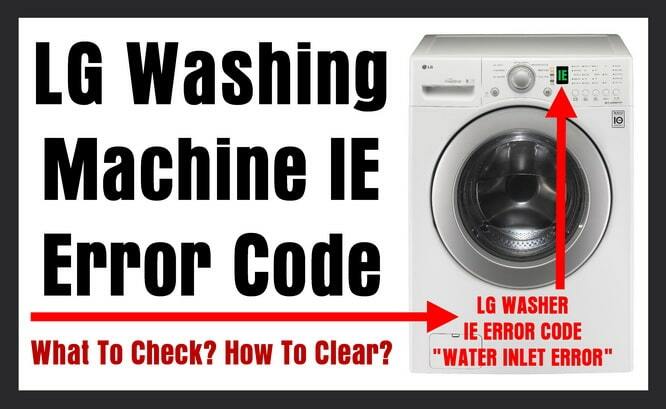 LG Washing Machine Displaying Fault Code IE or 1E = The official error code is IE but may look like 1E. So if your LG washer shows IE or 1E error or fault code, you know the washer is not receiving water. Do you have questions about your LG washing machine getting the IE or 1E error code and need HELP? Please leave a comment below and we will be happy to assist. I opened the top of the washing machine. There was a rubber flexible pipe not connecting to a tube. I connected it again and the LG waching Machine IE problem was gone. 1 minute work… The rubber went off because the extra heavy drum and shaking moves of the washing machine. It’s a small hose on the drum that comes off but it’s hard to see unless you pull in it a bit, then you see it was barley connected. This will fix the issue of flooding your garage. Mine has done it twice and I made sure I put it on tighter this this time. What does the red circle with a key and line through the circle mean? I can’t locate this info anywhere and this is on my washing machine and nothing will run. How do I clear this? Thank you so much in advance for your help. I have the LG Inverter Direct Drive washing machine. It means the door is locked. My machine is having this error. I’ve put the outlet pipe into a bin and let the water into there. I’m getting 30 litres of water into the system when starting a cycle that then gets chucked into the bucket at the end. That seems way too much which leads me to believe the issue is likely to do with the system not knowing it has plenty of water. Is that likely to be the pressure switch? i have been having an issue with my LG washer it seems to fill then slows not to get filled the way it used to or supposed to i check my lines filter both sets and are clear my washer runs part way through its a hit and miss weather it uses the soap then stops with an IE code and if by chance it does run all the way through the fabric softner is still full what do i do any ideas? We’ve been getting an IE error often. It seems to just quit during the cycle. But instead of water not filling, it just has too much water in the drum (not draining) when it shuts down. It also takes longer than it should. For example, when set to a quick wash for 28 minutes, you come back 20 or 30 minutes later and it still says 20 minutes left. Could it just need to be replaced. It is 11+ years old. My LG washer is filling with water, not a problem, but after a few minutes it displays the IE error code and starts draining. I have checked all that you suggested on my LG Dishwasher. But I have noticed that the drain pump is not shutting off. I even put my thumb over drain hose and keep getting pressure? I have an LG Washer. When starting a load and when the load starts the rinse cycle the water fills rapidly for approximately 1 minute then it cuts back to a dribble instantly while the drum still turns. It continues to dribble with the drum turning for seems like 12 minutes then displays code IE. You have to stop and restart the cycle so it will again repeat the rapid fill / cut back to a dribble routine. I have cleaned the filters and my water pressure ranges from 20 lbs min to 40 lbs max. This machine has done this from day one (about 5 years old now). I had a service technician come out while it was still under warranty. He replaced the fill valve (did not help). I have replaced the fill valve again since then (did not help). Is there any way to force the washer to just fill up and stop dribbling? Problem solved. The initial fast flow was through the hot water valve (5.76 volts during filling) The hot valve would close after 1 minute and the remaining dribble was through the cold water valve (5.76 volts during dribble). Both hose inlet colored screens were clean and clear. Upon closer inspection with them removed THERE IS ANOTHER SET OF SCREENS behind them. Hot was clear, cold was plugged. After cleaning cold flows full stream while valve is receiving 5.76 volts. NOWHERE IS THERE ANY MENTION OR REFERENCE TO THE SECOND SCREEN SET. Fred was right, I found a second filter behind the plastic one they show in the manual for my LG WT7200CW Washer. Even though the plastic filters never clogged, the metal fine-mesh one behind it was completely clogged on Cold Water side. Since the metal filter is domed outward, I took the machine apart, hoping I could reach it from the back side to push it out. That was a waste of time, as the water inlet valve is behind the screen, and there is no way to get to the filter. I gently pried my out with a screw driver. I deformed it a little, but I was able to get it back into shape. (There is a black plastic or rubber circular piece under the mesh, but it remains in the tube.) Perhaps you could get the metal mesh filter out with a magnet, but it was in there pretty snugly. I cleaned out the filter and the silt that was in the filter tube area. That seemed to correct the IE error problem. I’m going to have to add a sediment filter where the water line comes into the house, otherwise I’ll have to keep cleaning out the washer’s filter. Thanks for the the tip Fred! Our Kenmore Elite washer also experiences the IE error causing the washer to stop. Folks are posting what appear to be short term fixes, but I believe it is a defect with the machine. I tried replacing several parts to no avail. My washer is only 3 years old and maintained well. This type issue should not be happening in a relatively new state of the art washer. Can it be fixed? So they say but it will require a service call at around ($300.00) three hundred dollars with no guarantee. Go Figure. Although I am getting the IE code my machine doesn’t seem to have a problem filling with water. If anything it is possibly too much water, it fills and then within five minutes of starting displays the IE code and starts to drain. Previous post: New HE Washing Machine Is Very Loud On Spin Cycle – What Can Cause This?